This post was co-authored with Laura Kirkpatrick and Maria Luisa Gambale of PassBlue, a publication that provides independent coverage of the United Nations. 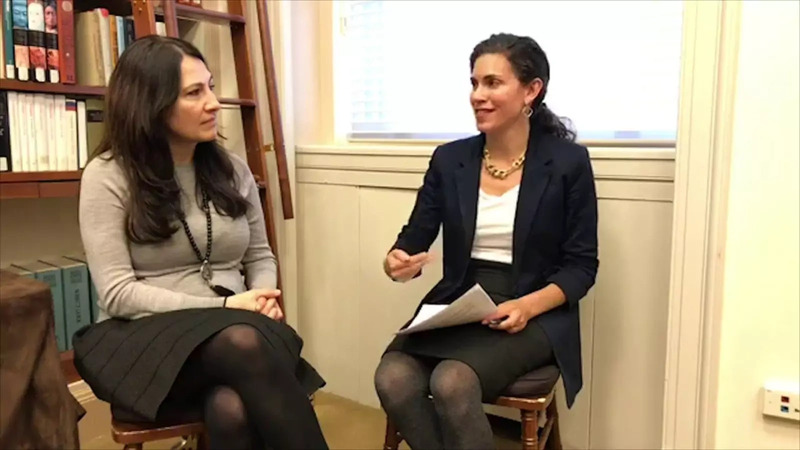 Mariam Jalabi, co-founder of the Syrian Women’s Political Movement and the Syrian National Council’s representative to the United Nations, reflected on Syria’s future in a recent conversation with Jamille Bigio, senior fellow in the Council on Foreign Relations’ Women and Foreign Policy program. Jalabi’s work focuses on women’s inclusion in politics and decision-making, and her advocacy and leadership at the United Nations has proven instrumental in framing the narrative on Syria with the UN community. With women missing from key decision-making positions, the discussion revealed perspectives that are consequently lost in vital conflict resolution negotiations and corresponding media coverage. Women’s under-representation at peace negotiations is a worldwide problem. A new Facebook Live series aims to bypass dominant information flows and bring viewers directly in contact with key voices with unique insights and deep ground knowledge--primarily women who participate in peace processes and post-conflict political transition. The series is hosted by PassBlue, a publication that provides independent coverage of the United Nations, with a concentration on women in foreign policy and peace operations. The discussion on Syria—the first iteration of the new series—was co-hosted by Georgetown Institute for Women, Peace and Security and sponsored by UN Women. Below are edited excerpts from the conversation, starting with Jalabi’s description of how she got started in her activist and political work. Some of the questions came directly from viewers watching the Facebook Live. You can view the full discussion below or on Facebook. Follow PassBlue to learn more about the series, and when the next conversation will happen. Mariam Jalabi: When the Syrian Revolution started, I couldn’t look anywhere else. And I saw that there were very few women at the forefront or being seen. So a few of my friends and I started talking about how to get more women included in the talks that were happening. This was back in 2011, even before the armed groups had changed the nature of the conflict. When the Syrian National Coalition was established, they actually came to me and said that they wanted more women in the opposition. And I agreed to join them, with the understanding that I would work on the inclusion of women in the peace process and in all talks about Syria. I thought it would be an easy job, but it’s proven to be very difficult. It’s not just a Syrian issue. It’s a global issue that women are not present at the tables and aren’t part of the political scene. Because of that, I became part of a group of women that wanted to do something different. We started the Syrian Women’s Political Movement last year. It’s a movement that addresses all the issues the general opposition is not addressing: inclusion of women, women’s rights, and a feminist foreign policy perspective. Jamille Bigio: What you’re doing is critical. As efforts toward a peaceful political resolution in Syria and elsewhere stumble and violent extremism spreads, we need to pursue new, more inclusive approaches to advance security. It’s not just that women are half the population. Research shows that women’s active participation in a peace process makes it 64 percent less likely to fail, and 35 percent more likely to last 15 years. But since 1990, women have only been 2 percent of mediators and 8 percent of negotiators. Jalabi: We Syrians are actually very well ahead. Bigio: Exactly. At the beginning stages of negotiations, Syrian women weren’t at the table. But in later rounds, it’s gone up to 15 percent. Numbers of course aren’t the full story, and you joined others in forming the Syrian Women’s Political Movement to have greater influence on the process. Jalabi: Being included in bodies that already exist has proven to be very difficult. You’ve got a woman here and a woman there, but we’re not systematically included. For the last six years, we have tried different ways to be included. One of the ways was to form our own advisory group within the opposition, following the model the UN created with the Women’s Advisory Board to Staffan de Mistura, the UN Special Envoy on Syria at the time. But in practice we found that this further marginalized women because they may be consulted, but they’re not sitting at the table. They’re actually not even in the room. They’re only involved in ways men define. And as much as I respect the Syrian Negotiation Commission, within it, the military forces were positioned to have the loudest voice. It became very apparent that we, as Syrian women, needed to come together in one front - because the whole of us together is so much stronger and influential than the sum of our parts working separately. There are different tactics that we can use. But it is a fact about the world that it’s difficult for somebody with privileges to give up those privileges. So, we do not ask. We act. Bigio: You mentioned the Syrian Women’s Advisory Board, which many have suggested should be replicated in other peace processes. What’s your assessment of it? [The Women’s Advisory Board was formed by Staffan de Mistura in 2015 with 12 members representing the political spectrum in Syria, to address the lack of women at the actual negotiating table.]. Jalabi: I need to be honest that at the beginning I thought maybe it was a good thing for women to have a formal advisory role. But it was done, as the UN has done so often in the past - as much as I respect that institution - with the view that women are one single entity who can sit at the same table with different political opinions, and should come up with wonderful solutions by finding the common denominator. But mostly, this was a mistake because it made women just advisors. We created a different kind of advisory committee for the opposition, which I was a part of. In hindsight, however, that committee also became a systematic way to marginalize women. So, we dissolved that committee, and now with the Syian Women’s Political Movement, we work to include more women in the negotiation committees that already exist. Bigio: Where is Syria’s opposition today? What are its priorities? Jalabi: It’s not about land. The media talks about what the regime has, and what the opposition has, who are the allies to the regime, and who are the allies to the opposition; they focus on this dichotomy. But they leave out the civilians, who started the revolution and continue to be engaged on the ground. When Syrians came out to the streets, we had zero land. The conflict originally started with people resisting a regime that imprisoned, tortured and detained with impunity, and had an emergency law in effect. We had zero land, and zero support from the international community. People still came out. Syrian people felt that they actually deserved to be free. Civil society groups are still working very actively on the ground. We’re still in the same place, that we want to create democracy, freedom, dignity for all Syrian people, not have a dictator that is just killing and detaining and executing with impunity. Bigio: As Russia and others push for greater attention to planning for Syria’s reconstruction, what do you think should shape those discussions? Jalabi: Syria is destroyed. It’s been destroyed at the hands of the regime and its allies. Because nobody else has the kinds of air power that the regime and Russia have, or the kind of ground power that the regime and the Iranians have. The destruction has affected the Syrian population en masse. There are over 3 million children that are school age but not going to school. And Syrian refugees left a situation on the ground that was not conducive to their livelihood. They could not survive. That has not changed. How are they going to come back to a place where there are no guarantees they won’t be arrested, detained, tortured, or killed? One of the very striking statistics that I keep talking about is that a seventeen year old teenage girl in Syria is more likely to be raped, tortured, or detained than to graduate high school. A lot of talk is happening about reconstruction - this is what Russians and Iranians are actually trying to push for. But the international community is saying that no reconstruction money should be sent unless there is some kind of (government) transition. How could you give money to a regime, to a government, that has actually destroyed Syria? You’re going to give them money, to rebuild and then destroy again? The reconstruction money has to come in through different means, in order to actually benefit the people. Bigio: Is there anything that brings you hope when you look at Syria today? Jalabi: When the Syrian revolution started, there were about 700 civil society groups registered in the country. And they were under the auspices of the government. But since the revolution started, over 2,500 organizations have sprung up in Syria and in the surrounding region. When I talk to people on the inside, and organizations on the ground, I get inspired by their resilience, by the ideas they have, by the work that they are doing. Because most people want the same things: respect of human life and human dignity, respect for children, respect for the elderly, respect for education, respect for healthcare, and respect for what makes a better country. This has given momentum for Syrian people to make decisions for themselves. Yes, we are coming together as women, but we are coming together because we want a solution for our country. We want to find a way to protect our citizens, our people, and create a space that respects everybody equally under the law, where everybody has equal citizenship.